Is BJ's Restaurants's Cash Machine Slowing Down? When judging a company's prospects, how quickly it turns cash outflows into cash inflows can be just as important as how much profit it's booking in the accounting fantasy world we call "earnings." This is one of the first metrics I check when I'm hunting for the market's best stocks. Today, we'll see how it applies to BJ's Restaurants (NAS: BJRI) . To calculate the cash conversion cycle, add days inventory outstanding to days sales outstanding, then subtract days payable outstanding. Like golf, the lower your score here, the better. 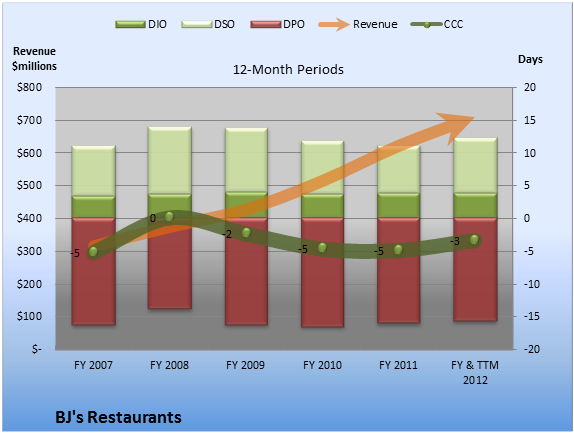 The CCC figure for BJ's Restaurants for the trailing 12 months is -3.3. Because of the seasonality in some businesses, the CCC for the TTM period may not be strictly comparable to the fiscal-year periods shown in the chart. Even the steadiest-looking businesses on an annual basis will experience some quarterly fluctuations in the CCC. To get an understanding of the usual ebb and flow at BJ's Restaurants, consult the quarterly-period chart below. Based only on the raw number, BJ's Restaurants has achieved the enviable feat of running a negative CCC cycle. That is, it typically collects what is owed it before it pays what it owes to others. On a 12-month basis, the trend at BJ's Restaurants looks OK. At -3.3 days, it is barely changed from the five-year average of -3.4 days. The biggest contributor to that degradation was DIO, which worsened 0.1 days when compared to the five-year average. 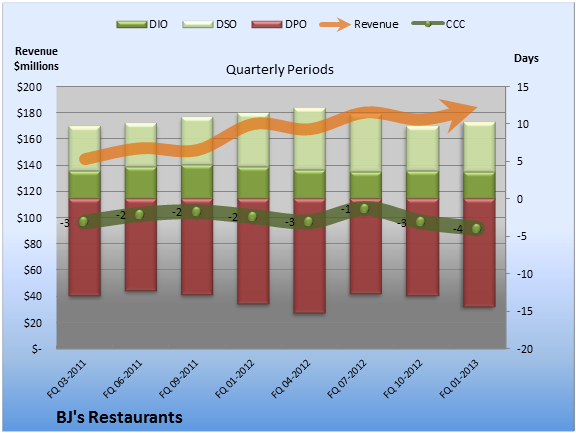 Considering the numbers on a quarterly basis, the CCC trend at BJ's Restaurants looks good. At -3.9 days, it is 1.4 days better than the average of the past eight quarters. With quarterly CCC doing better than average and the latest 12-month CCC coming in worse, BJ's Restaurants gets a mixed review in this cash-conversion checkup. Does BJ's Restaurants have what it takes to execute internationally? Take a look at some American restaurant concepts that are generating profits in all over the globe in, "3 American Companies Set to Dominate the World." It's free for a limited time. Click here for instant access to this free report. Add BJ's Restaurants to My Watchlist. The article Is BJ's Restaurants's Cash Machine Slowing Down? originally appeared on Fool.com. Seth Jayson had no position in any company mentioned here at the time of publication. You can view his stock holdings here. He is co-advisor ofMotley Fool Hidden Gems, which provides new small-cap ideas every month, backed by a real-money portfolio. The Motley Fool recommends BJ's Restaurants. The Motley Fool owns shares of BJ's Restaurants. Try any of our Foolish newsletter services free for 30 days. We Fools may not all hold the same opinions, but we all believe that considering a diverse range of insights makes us better investors. The Motley Fool has a disclosure policy.